Since ScoreVision jumbotrons provide so much more than just standard scoreboard functionality, the benefits can reach every student in your school. Check out how ScoreVision jumbotrons can benefit students in music programs too! 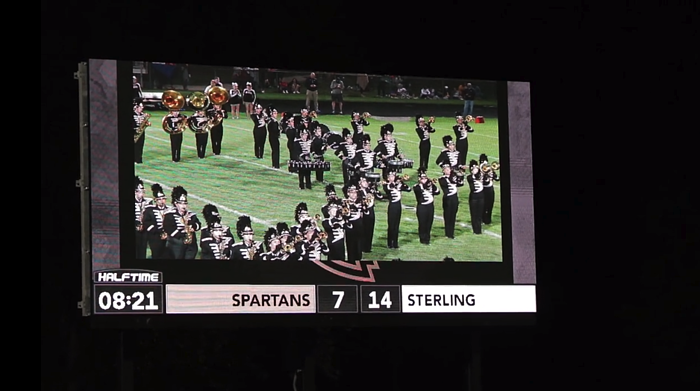 Marching bands can display everything from practices to performances and competitions on a ScoreVision jumbotron. Previous performances can be recorded and played on the jumbotron for critiquing during practice, and performances can be live-streamed to the jumbotron to allow for close-ups of the musicians. Show choirs can use ScoreVision jumbotrons to elevate the competitions they host. Model your school’s next show choir competition after Westside High School, who recently hosted their annual Competition of Excellence show choir competition, enhancing the experience in a big way with their ScoreVision system. They leveraged their multimedia displays by transforming their gym into an overflow space for spectators, showing a live stream all day of the performances on their jumbotrons when the auditorium sold out. They also used their gym to host the awards ceremony, displaying a slideshow of the winning ensembles on the multimedia video board. See this creative idea in action in the short video below. ScoreVision jumbotrons can also be used by dance teams for practices and performances. If the dance team performs during a pep rally or a football game, a live stream on an indoor or outdoor jumbotron can provide close-ups of the routine to fans and fellow students. Footage can also be displayed on the jumbotrons for reviewing and critiquing performances during practice. Check out all three of these creative ideas using ScoreVision jumbotrons in our short video below! ScoreVision technology has made it possible for a scoreboard upgrade to benefit so many more programs in addition to athletics. Installing a ScoreVision multimedia scoreboard can impact every student in your school through the endless alternative uses made possible by our software and jumbotrons. These ideas represent just a few of the creative uses our customers have come up with – see more alternative use ideas on our blog here and check out last week’s blog post full of ideas of using your ScoreVision system for sports practices, film review, and gym class! Follow us on Twitter, Facebook, and our e-newsletter to be the first to know when it’s released.